For example, silver recycling from the photography sector has declined since consumption peaked in 1999. The photography industry was using 228 Moz of silver in 1999 compared to the 44 Moz last year. Thus, silver consumption in photography has declined by 80% in nearly two decades... and along with it, a great deal of recycled silver supply. Furthermore, a lot of silverware was recycled during the period of rising prices (2007-2012). A lot of Millennials who inherited their parent's (and grandparents) silverware decided it was much easier to pawn it rather than spending a lot of time polishing it for holiday gatherings. Which means, a lot of available stocks of silver scrap have already been recycled. What this tells us is that owners of silver jewelry are not that motivated to pawn their silver jewelry because there just isn't enough monetary value. 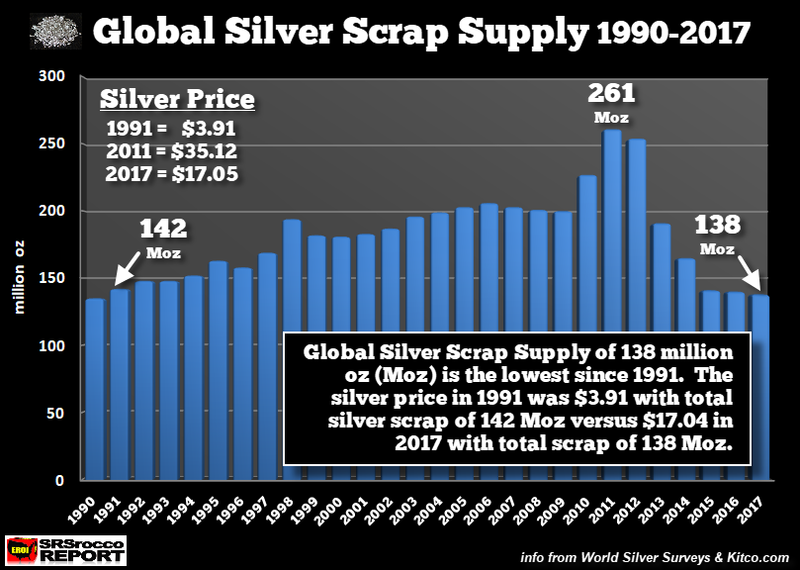 So, a large supply of potential silver scrap will likely never make it to the market, even at much higher prices, due to the relatively small value of silver jewelry held by individuals. As for gold jewelry, it's quite the opposite. Nearly 90% of global gold scrap supply comes from recycled gold jewelry. Thus, a significant increase in the gold price would result in higher gold jewelry recycling, whereas a higher silver price would not generate much of an increase in silver jewelry scrap supplies. So, each year about 200 Moz of silver are used in silver jewelry fabrication, but only a small amount is ever recycled.